A gun can be dangerous if it is not taken care of and handled properly. One thing that every gun owner should know is how to safely and correctly dismantle their gun. 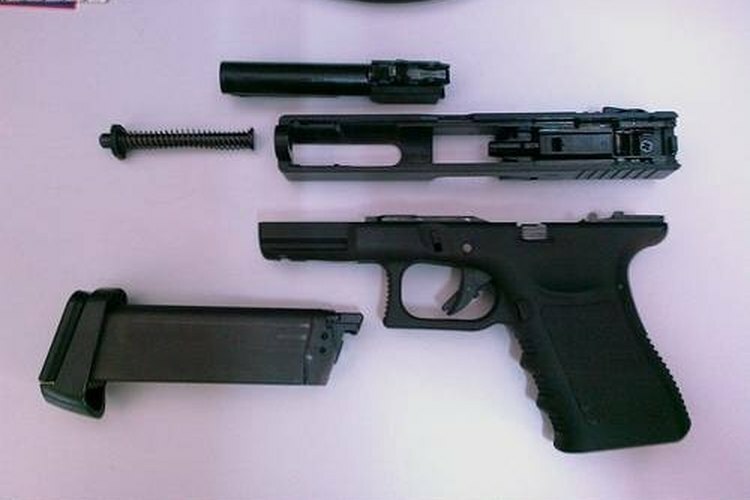 Whether someone wants to clean their gun or simply take it apart to store it safely, taking apart a gun is a useful skill. Click the safety button in on the gun to make sure that it does not go off accidentally while you are dismantling it. For most guns the safety is on the right side of the handle near the top left corner of the gun's trigger. Remove the gun's magazine, which holds the bullets, by pressing the release button on the side of the gun's handle. While holding down the release button, slide the magazine free and set it aside. Pull back on the gun's slide, which is on top of the gun's barrel. When you pull back the slide you will see if there is a bullet still in the chamber. If there is still a bullet in the chamber, pulling back the slide quickly should make the bullet pop out. However, if the bullet does not pop out on its own then you will need to carefully remove it while holding the slide open. Remove the gun's slide piece by locating the two release buttons on the right and left of the slide directly above the gun's trigger. Pull back slightly on the gun's slide. Push both release buttons down and push the gun's slide forward. This will make the slide separate from the rest of the gun. Flip the slide over to expose the string and barrel of the gun. Remove these pieces by first pushing the string forward so that it can be separated from the barrel. After the string is removed the barrel can be lifted out freely. Always use extreme care when handling a firearm. Never point the gun at yourself or anyone else.